In her illuminating talk, Alina Fernandez, the daughter of Fidel Castro, relives her first-person account of growing up in Cuba, and the many, broad-sweeping changes affecting Cuba today and into the future, as a result of Obama-era politics and social and political reforms. She is a witness with a unique vision, not only of her father, and how the country changed after The Revolution, but of Cuba’s rapidly-changing climate right now, uncertain future, and tremendous potential for a better life in Cuba for everyone. Ms. Fernandez grew up in a convulsive Cuba, living with the ongoing threat of invasion by American troops. Through her insight as one of the Cuban elite, Alina guides you through her life in Cuba and describes the surrounding political environment during the 1960’s and 70’s. Weaving in her unique sense of style and humor, she reveals exciting and suspenseful anecdotes, snapshots of Cuban society, her inside scoop on Cuban politics, and a detailed view of her father. 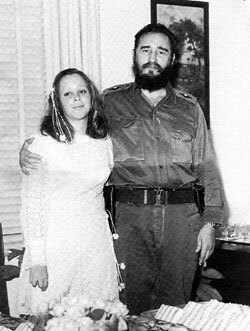 As one of Fidel Castro’s children, Alina had a strangely mixed upbringing; a combination of privilege and privation. This is her private story, told from her intensely personal point of view. Alina speaks for herself and the people of Cuba with whom she knew over the last forty years, rather than as an expert on Fidel Castro, as the political ruler of Cuba. Alina was just a toddler when Castro overthrew the Batista government during the 1959 Cuban Revolution. She saw Fidel Castro on the television screen and then in her living room, as Castro would frequently visit her at night. Alina played tirelessly with him until dawn. Then he would disappear for months at a time. As Alina grew up and opened her eyes to the political climate in Cuba, she became rebellious, and in the 80’s became part of the political dissident movement on the island. By 1993 she was forced to flee Cuba which she accomplished by mastering the art of disguise. Today, Alina resides in the United States. St. Martin’s Press published her story, Castro’s Daughter: An Exile’s Memoir of Cuba.